Forget the living room or “family” room, the kitchen is the place to be in any home. Besides cooking and eating in there, it is also the spot where the kids do their homework, mom and dad read the paper, and family and friends gather to talk and munch. Which explains why it’s the first room homeowners renovate and apartment dwellers try to spruce up every chance they get. If you’re looking to lighten with new fixtures, brighten with a funky tile floor, or just change up your current island stools, then check out our list of Fantastic DIY Kitchen Decor Ideas. From checkered ceilings to hidden storage these designs will whet your design appetite and make dinnertime better than ever. We’ve also imcluded the links to each photo for design credit and to give you instructions for some of the projects. A simple and striking way to add a little something to a monotone kitchen is with a bright checkered ceiling like this one. The checkered pattern is unexpected, making it a fun focal point for family and visitors. And you can get as creative as you want, using any accent color you want or pattern. 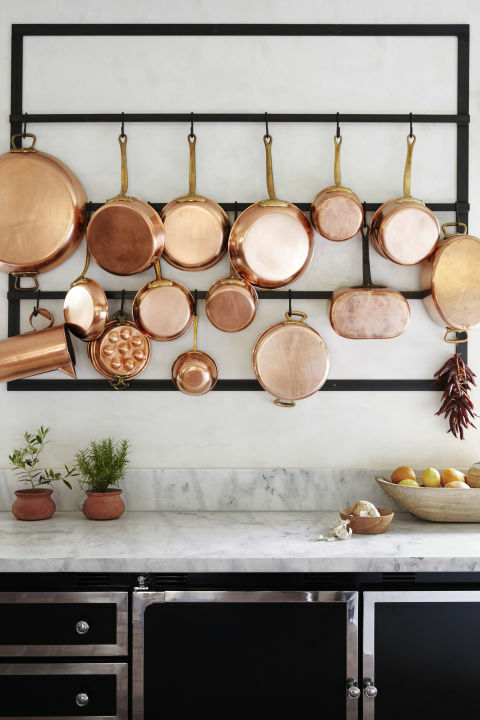 If you have snazzy copper pots why not display them? This ingenious rack not only saves you cabinet space if your limited but makes a stylish piece of wall art, giving the room a warm and cozy feeling. 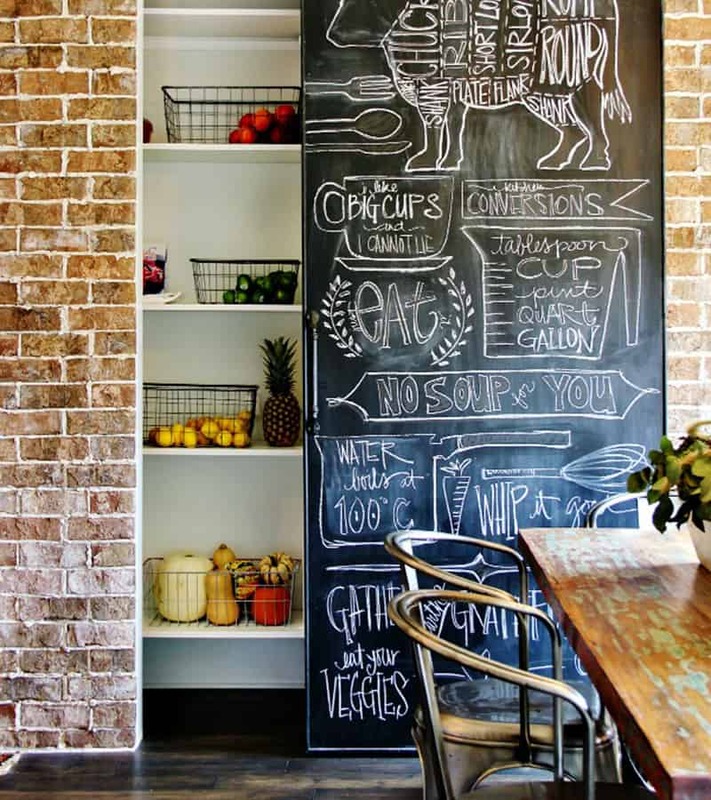 Why use a conventional pantry door when you can create a chalkboard barn door everyone can have fun with? This is a brilliant and practical way to spruce up your kitchen because you can have kids draw pictures, write down inspirational quotes, jot down shopping list items, or put up the day’s menu and chores. And this style door is super easy to put together. 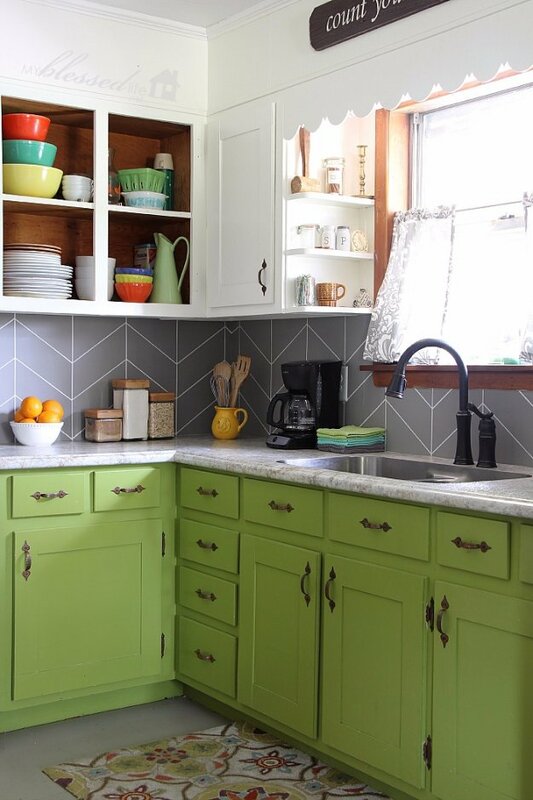 Paint is a great way to give your kitchen a different look, especially when you use it to create an eye-catching floor pattern or update a traditional one. A floor like this adds a pop of color and especially nice for spring and fall; the beauty of paint is you can switch it up whenever the mood strikes. Islands are on just about everyone’s must-have list and this one is sure to be at the top of the list. Adding extra storage to some of the unused space gives it a unique look at ensures you have what you need right at your fingertips. Your refrigerator is like a blank canvas, so use it to add some personality to your kitchen decor. Using simple contact paper, you can go polka dot crazy if that’s your thing. The beauty of this is you can change it out; so you can do Santa paper at Christmas or flags for the Fourth of July. Everyone will love it, especially kids. 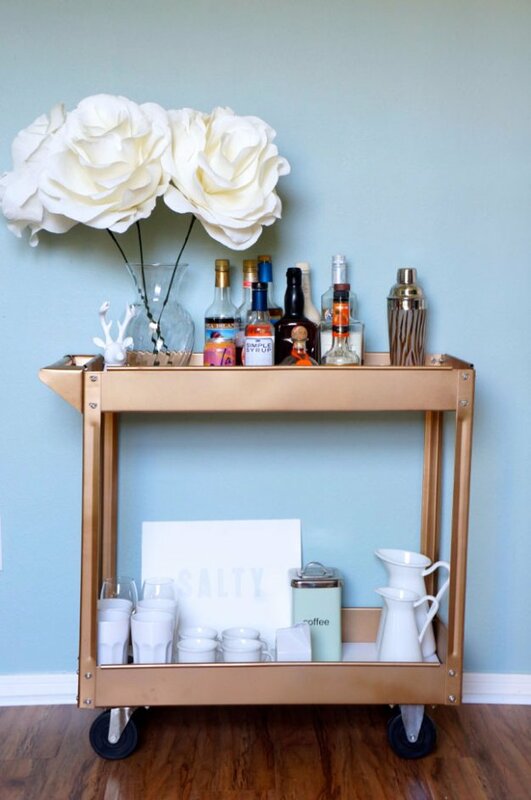 Add shelving anywhere with these cute hanging shelves. 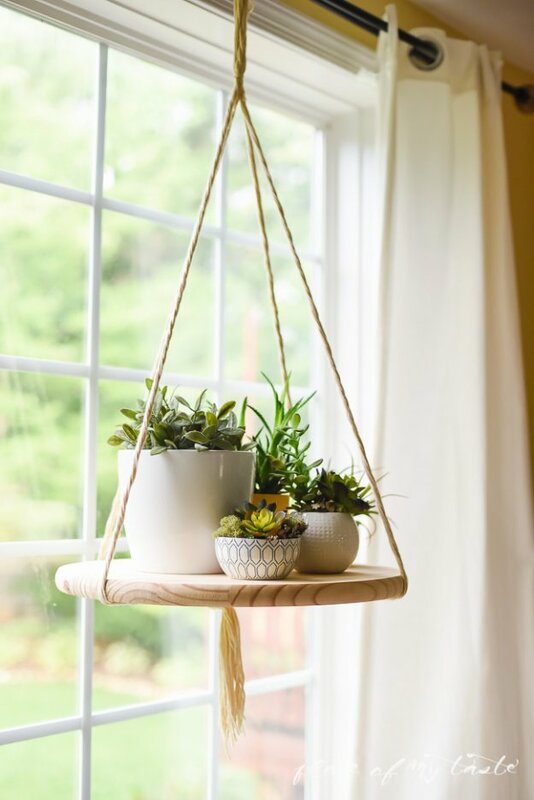 You can use any material to create them, from wood to plastic, so it will match the current style of your kitchen and you can use them to hold plants, cups, or anything else depending on the size and shape. Function can be fun when you use a peg board like the one above to hold your most used items. It is quick and inexpensive to put together and can be used to add some color to a neutral kitchen. 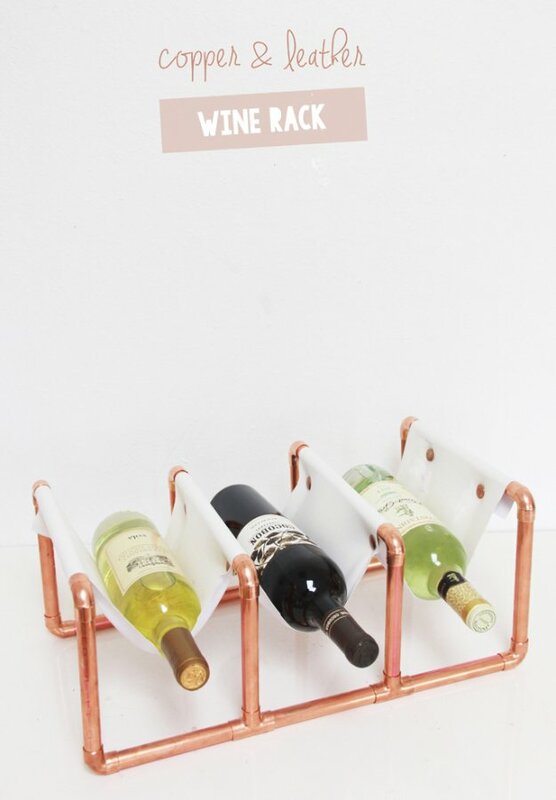 What’s a kitchen without a wine rack? Not a fun kitchen if you ask me. This funky, do-it-yourself rack is a great way to display your favorite vino and fits on any countertop. And if you don’t have copper or brass you can use a different metal that better suits your tastes. If you entertain a lot a rolling bar is great because you can keep it in the kitchen and have it double as a prep space when it’s just you and the family. You can put plates and serving dishes on it at dinnertime to declutter the table and when company comes use it for drinks or even to transport food to the dining room. Backsplash is seen by many as a permanent design choice, but as this DIY project shows, it doesn’t have to be. By using paint and a clever design you can give the appearance of tile without committing to it. For those who like change or tend to switch things up often, this is an inexpensive way to make a creative splash. Take ordinary stools and make them extraordinary by drawing a vintage design on them like this one. You can really draw just about anything, from a ship anchor for a nautical themed kitchen to baking utensils. The idea is to enhance the beauty of what you already have and add some character to the space. Adding a rug instantly makes the kitchen feel toasty and inviting. And if you make one yourself you can have it be the exact size and color you want; you’ll also impress family and friends, who may request one for their own kitchen. 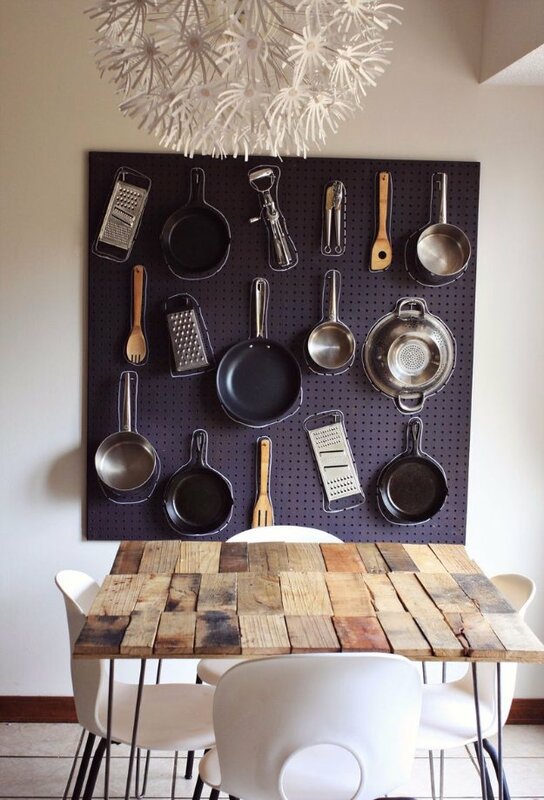 Give your kitchen an urban, rustic charm with this pot rack made from a wooden pallet. Not only is this sturdy, but it blends a bit of industrial with some farm elements for an eclectic look that works with most decors. A frame doesn’t always have to hold a picture. Create one like this to display a favorite saying and hold kitchen essentials like fresh herbs, towels or mixing tools. So, was I right? 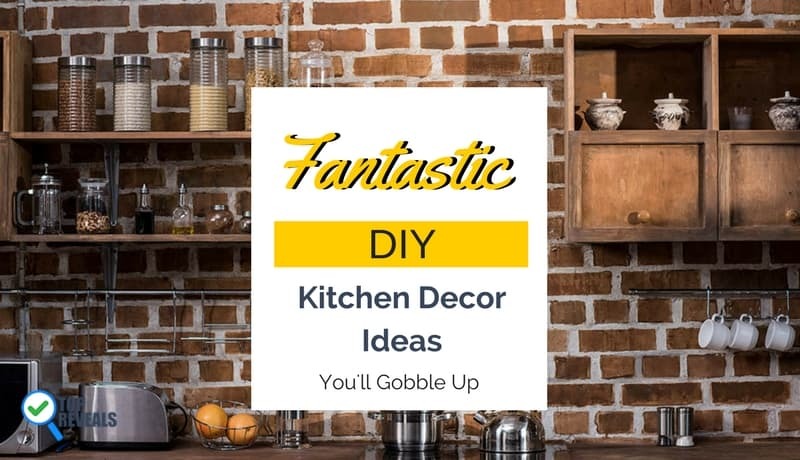 Were these Fantastic DIY Kitchen Decor Ideas or what? Try one or all of them and I guarantee your kitchen will be overflowing with people and love. 17 Easy Sandwich Recipes For Any Meal - Mmm Mmm Good!